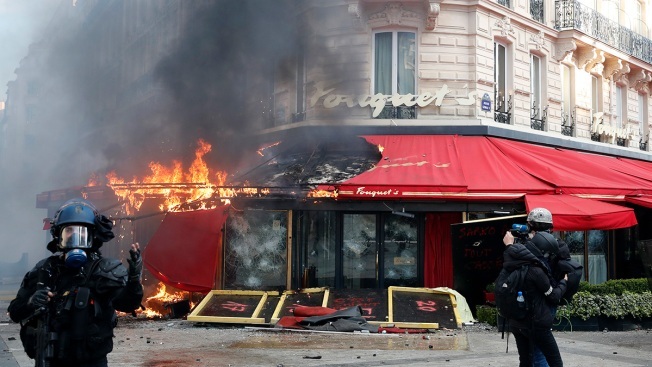 Paris famed restaurant Fouquet's burns on the Champs Elysees avenue during a yellow vests demonstration Saturday, March 16, 2019 in Paris. 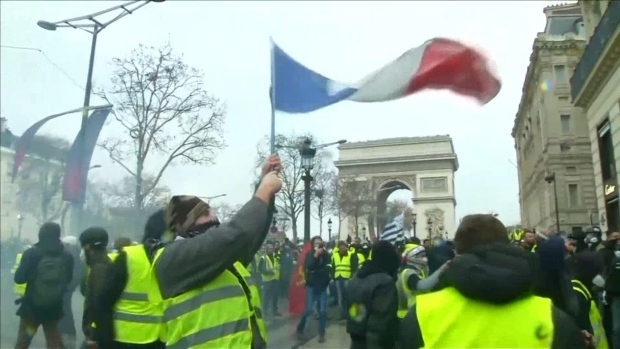 Paris police say more than 100 people have been arrested amid rioting in the French capital by yellow vest protesters and clashes with police. They set life-threatening fires, smashed up luxury stores and clashed with police firing tear gas and water cannon. French yellow vest protesters set life-threatening fires, smashed up luxury stores in Paris and clashed with police Saturday in the 18th straight weekend of demonstrations against President Emmanuel Macron. Large plumes of smoke rose above the rioting on Paris' landmark Champs-Elysees avenue, and a mother and her child were just barely saved from a building blaze. Paris police told the AP that 192 people were arrested and 60 others were injured, 18 of them police and firefighters. Chris den Hond, Milos Krivokapic, Catherine Gaschka and Elaine Ganley contributed.